An enhanced selection of delectable specialties has been presented with the first in a quarterly series of Spiral's Sunday Brunch. Le Grand Royal Brunch has brought guests in the wonderful pleasure of gastronomy and showcased The Margaret Collection of multi-awarded fashion designer, Albert Andrada. Sofitel Philippine Plaza Manila started the year in royal fashion as Spiral presented Le Grand Royal Brunch enhanced by an elegant and nostalgic fashion show by multi-awarded fashion designer, Albert Andrada, presented under the creative direction of Robby Carmona. For his fifth sartorial showcase at Sofitel, Albert created The Margaret Collection, inspired by the timeless royal fashion of Princess Margaret, Countess of Snowdon. The 14-piece collection featured colors of the crown jewels including ultra violet, the pantone color of 2018. Models walked through Spiral and its iconic staircase donning golden pearls by Jewelmer with glamorous make-up by Guerlain. The celebration was a royal engagement of its own as guests arrived in fabulous high tea outfits. Lifestyle blogger couple David Guison and Vina Guerrero, wearing matching outfits in blush shades, both won the Best Dressed Awards and received special gifts from Tefal and Jewelmer. Model couple Hideo Muraoka and Fatima Rabago were awarded the King and Queen of Hearts Award receiving special gifts from Tefal and Elizabeth Arden. Model-photographer Jo Ann Bitagcol was awarded the Lady Guerlain Award while high-society columnist Tina Jacinto was awarded the Elizabeth Arden Lady Award. Fashion enthusiasts were able to channel their glamorous style with colorful fascinators by Hat Momma showcased by the Le Grand Royal pop-up booth, adding a charming touch to the royal aesthetic of the celebration. Discerning gourmands also got the chance to win special gifts from Power Mac Center, Tefal cookware, Cuisinart, Guerlain and Elizabeth Arden. The day was a fun-filled family affair with live musical entertainment by Hans Dimayuga, exciting magic shows, giant wall painting for guests to showcase their inner Picasso and Kids’ Corner with arts and crafts for the young VIPs. The first in a quarterly series of leisurely lunch gatherings held in the multi-awarded Spiral restaurant, Le Grand Sunday Brunch adds color to the weekends of hearty gourmands with the following featured dates: April 29, July 29 and October 28, 2018. 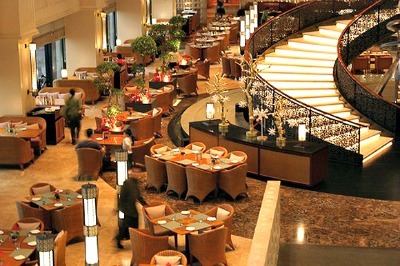 Spiral regularly features a leisurely Sunday brunch with family, friends and loved ones as the weekend draws to a close. Embark on a journey of taste through Spiral’s 21 dining ateliers with featured wine trolley and champagne enhancing a truly sensory dining experience.